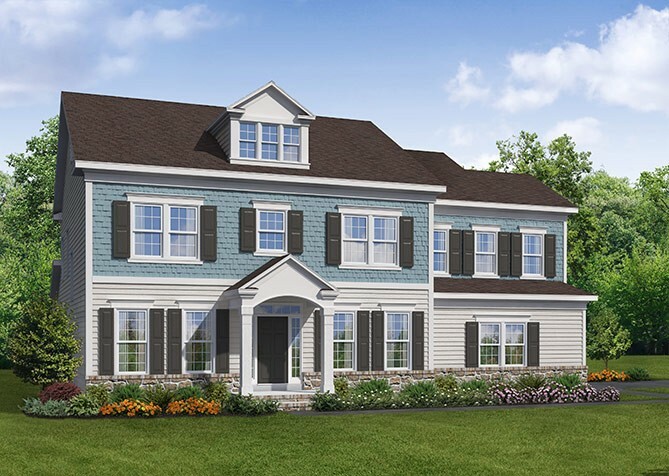 THE GRANT - Starting from $432,900 4 - 5 Bedrooms / 3.5 - 5.5 Bathrooms / 3,532 - 5,142 sq. ft. Our most innovative estate plan yet, The Grant provides classic sophistication and enhances it in a way that is modern and exciting. It takes the concept of open living to the next level, focusing on a unique connectivity between the home’s interior and the outdoors. With the breakfast area adjacent to the kitchen, the island enjoys a beautiful view out of the back of the home, where, just beyond a full wall of sliding glass doors, an optional patio or covered porch can lend an open-air feeling to the kitchen. This connectivity extends the stunning entertaining space that the designer kitchen’s oversized island already offers. Upstairs, an incredibly generous owner’s suit spanning the width of the home features two large walk-in closets, plentiful natural light and a luxurious bathroom. Three generous additional bedrooms, including one with an en-suite bathroom, all include walk-in closets. Square footage from 3,532. Starting from $432,900.